If you are building in the metro Atlanta area, this is a great time for custom landscape and hardscape design and installation. 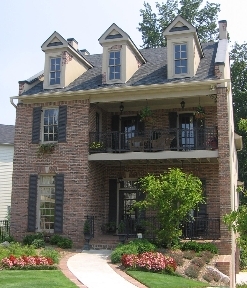 Many builders within the Atlanta area offer a basic landscaping package with the sale of a new build. Often, this includes basic starter type elements such as simple bushes, shrubs, pinestraw, and minimal sod installation. As a proud new homeowner it is nice to be able to take advantage of having a beautiful exterior as well as interior. With a home just having been constructed, this is the perfect time for hardscape installation. Whether a backyard waterfall, custom patio, fireplace, grill island, or fire pit is what you are looking for, Hutcheson Horticultural is capable of designing and installing all of the above. A custom hardscape will allow for ours of relaxation and entertainment outdoors. Of course, you’ll want to finish it off with plush pushes and floriculture enhancements to finish off the look. Not only can landscaping installation provide beauty and value, but it can also provide a certain element of privacy over time. We are currently installing our custom landscape and hardscape creations in several new construction neighborhoods in the Cherokee County, Cobb County, and Fulton County. In addition to working with new construction, we also work with many local homeowners associations for installation and maintenance of common areas including Cabanas, pool surrounds, neighborhood entryways, and boulevards.